The fastest 32/64-bit image viewer EVER, designed for photographers. Designed with pro photographers in mind, FastPictureViewer is a slick 64-bit image viewer and culling tool engineered for viewing and rating digital images faster. The program features full color management with profiled monitors, instant zooming and copy/move/delete functions, plus industry-standard Adobe XMP rating, ideal for fast reviewing, culling and rating of large quantities of images. 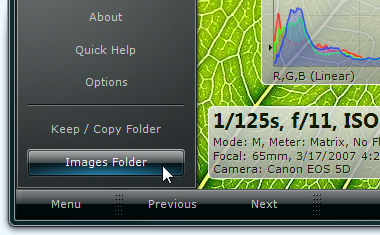 It displays shooting data (shutter, F-stop, ISO, exposure compensation) and histogram in seamless floating windows and features a built-in program launcher, all in a slick and uncluttered user-interface. A tethering function is available and works with cameras compatible with the MTP/PTP protocol, which includes most Nikon DSLRs. The software supports fast previewing of raw image formats such as Nikon NEF, Canon CR2, Panasonic RW2, Olympus ORF and Adobe DNG with its bundled image decoders. Standard image formats such as TIFF/MTIFF, JPEG, HD Photo, PNG, GIF, BMP and ICO are supported. The program has been translated to 13 languages and is able to browse folders and images with names written in any language. One of Germany's largest computer publications, "c't Magazin fur Computertechnik", dubbed FastPictureViewer "the Porsche of image viewers" and described it as "unbeatably fast" in a roundup that included several other image viewers and image editors (issue 19/2008). In another article from the same magazine, FastPictureViewer Professional was listed among the tools available to photographers considering an Adobe DNG based workflow (issue 05/2009). FastPictureViewer is the first of a new breed of hardware accelerated desktop applications and delivers unprecedented speed and ease of use. The download includes a 64-bit and a 32-bit installer, as well as the FastPictureViewer Codec Pack universal trial installer. Upload to Zenfolio.com plugin has been updated, following deprecation of the Zenfolio API 1.6; Additional improvements to substitution variables and functions. Great thgknini! That really breaks the mold!